Craftster Community > IMAGE REPRODUCTION TECHNIQUES > Screen Printing: Completed Projects (Moderators: loves2experiment, LimeRiot) > Octopus "silkscreen"! my first. I dont remember the tutorial i read but i just used see through fabric stuff stapled it to a wooden frame and the used mod podge on the negative space. its soo cute! i love my little octopus! Sometimes he calls me Al. Re: Octopus "silkscreen"! my first. the octupus is adorable! and i love that shirt color! I love that! 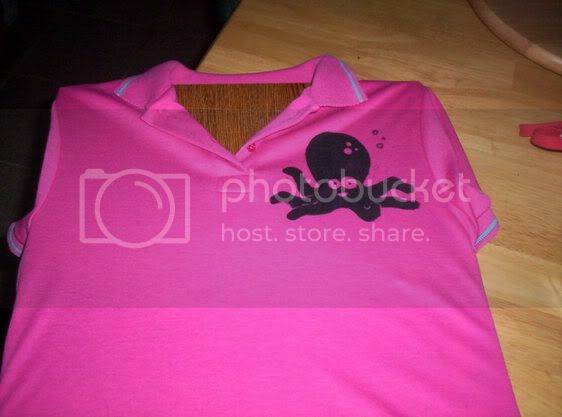 The octopus is super-cute and the shirt color is really sweet, too. Wow thats very nice looking! That octopus is so cute too! It's a picture puzzle - Doctor Who style! Bugs, bones, wings, and things: my emulsion printing adventure!